Research on small groups is highly diverse because investigators who study such groups vary in their disciplinary identifications, theoretical interests, and methodological preferences. 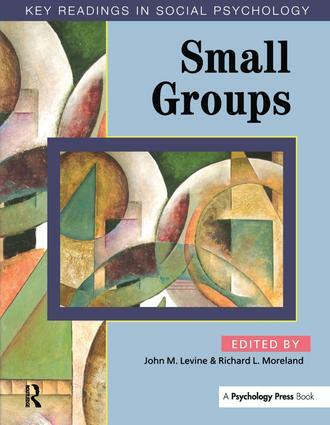 The goal of this volume is to capture that diversity, and thereby convey the breadth and excitement of small group research by acquainting students with work on five fundamental aspects of groups. The volume also includes an introductory chapter by the editors which provides an overview of the history of and current state-of-the-art in the field. Together with introductions to each section, discussion questions and suggestions for further reading, make the volume ideal reading for senior undergraduate and graduate students interested in group dynamics. Reading 3 Effects of Crew Composition on Crew Performance: Does the Whole Equal the Sum of Its Parts? Reading 10 Does Power Corrupt?